How do I return to the settings screen? The settings screen in Simple Booth apps allows you to customize all of the elements of your booth. Once the booth is launched into "Booth Mode," there is no in-app button to return to settings. We've done this to prevent your guests from changing any of your settings. When you need to go into settings to make a change, close the app by double-tapping the home button on your iPad and sliding the app up (or using the equivalent on-screen gesture for newer iPad models). Then, find the app icon again on your iPad (or search for it) and open it up. You will be able to change settings before you launch the booth again. You can restart the app as stated in the instructions above, but with the HALO app you can also make live changes to your settings from your online account that take effect on the next photo session. This means you do not have to be physically on-location and you do not have to close the app or interrupt the flow in order to make changes. For a lot of our clients, customizing the booth involves taking a whole bunch of test pictures to make sure the settings are just right. Our Test Mode allows you to take test pictures and return to your settings quickly and easily in order to make further changes to the booth. To enter Test Mode, tap the button in the upper right corner of the settings and tap the “test” button instead of launching the booth. 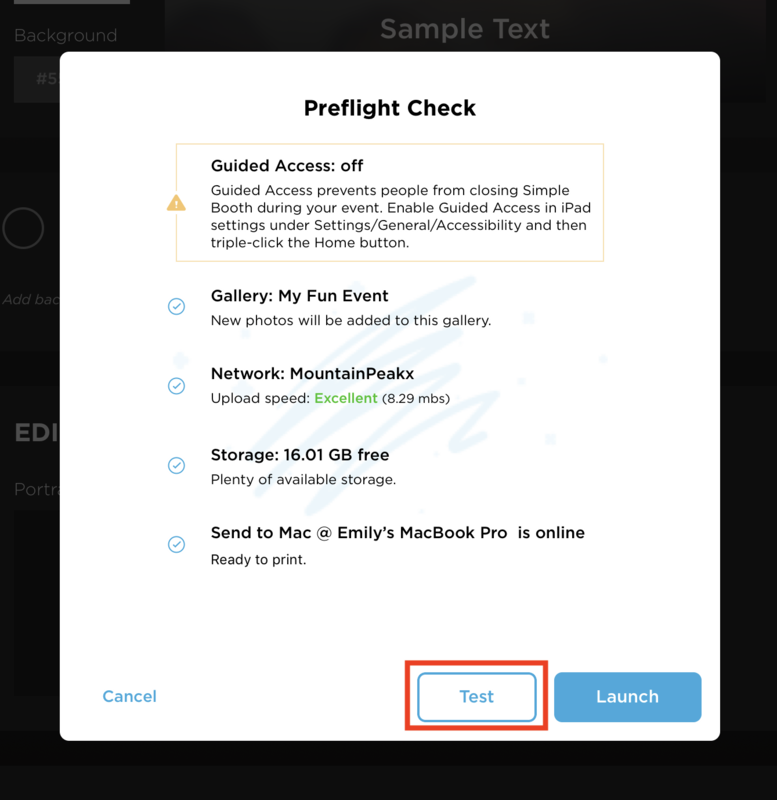 Once you're ready to start your event and launch the booth, the app will prompt you to delete any tests photos that you do not want on your Gallery.